Following several delays that left many collectors frustrated, Topps has finally launched their Super Bowl Legends website that allows collectors to use codes to unlock football cards and other prizes. Code cards can be found in 2011 Topps Football. 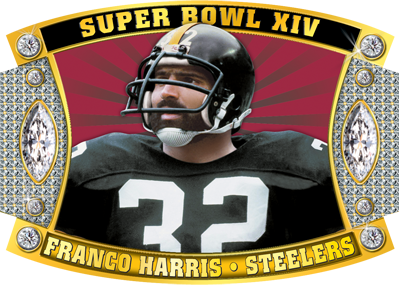 After registering on the site, users enter the unique code and get either an exclusive die-cut Super Bowl Legends card or a Super Bowl-themed digital item. The cards use the same technology as the Diamond Giveaway cards from a similar program in 2011 Topps Series 1, Series 2 and Update Series Baseball. Gold and one-of-one diamond parallels can also be unlocked. Super Bowl Legends Diamonds have jewels embedded in the cards. Super Bowl digital items come in the form of coins, jerseys and rings. Each has 45 different items. Collectors who unlock all 45 digital items in one area automatically win an autographed Joe Namath card. After unlocking ten unique items of a single type and collectors are entered into a draw for a Namath autograph. Other prizes include $10 gift cards for Topps' online store. Both cards and digital items can be traded on the Super Bowl Legends website. Cards will be available for delivery around the start of October. I have 4 Topps Super Bowl Legends giveaway cards and the website says it is done I also have 2 topps attac cards and website says the same thing. I spend lots of money on your cards and I can’t even take advantage of these things. What can I do? Gregory Hawes (ID 60279) � Unfortunately, probably nothing. The Super Bowl Legends I know had an expiry date printed right on them. The website also sent out several emails leading up to the program ending to those with accounts.